Report by the Secretariat to the All-Party Parliamentary Group Friends of Syria, 5 December 2016. View and download a PDF version. This is not an official publication of the House of Commons or the House of Lords. It has not been approved by either House or its committees. All-Party Parliamentary Groups are informal groups of Members of both Houses with a common interest in particular issues. The views expressed in these pages are those of the group or of individual contributors. The prohibition of force in Article 2(4) of the Charter of the United Nations is limited in scope and allows humanitarian action where such action does not compromise the territorial integrity or political independence of the state in question and is consistent with the purposes of the UN. UN Security Council Resolution 2139, reinforced by subsequent resolutions, demands an end to shelling and aerial bombardment in populated areas, and demands that in particular the Syrian authorities promptly allow rapid, safe and unhindered humanitarian access for UN humanitarian agencies and their implementing partners, including across conflict lines and across borders. Following UNSCR 2139, monthly reports by the UN Secretariat to the UN Security Council have provided ample evidence of extreme humanitarian distress on a large scale, requiring immediate and urgent relief. In failing to respond to these monthly reports with measures to enforce its own resolutions, the UN Security Council has failed to fulfil its function under the Charter. As the aim is to protect civilians, any action should avoid harm to civilians. A clear legal framework would be required, including concrete examples of what military action may be considered, a clear and transparent list of criteria, and a clear explanation of the parameters. A General Assembly ‘Uniting for Peace’ resolution would offer recommendations only and not binding measures, and is not necessary in order for the UK to take action. As the UK Government has long maintained that humanitarian intervention outside the Security Council is legal if implemented in accordance with its three tests, the dire emergency in Aleppo and wider Syria allows legally justified action now without any further delay by a superfluous General Assembly process. Current UK military action in Syria as part of the International Coalition is legally justified as collective self-defence of the state of Iraq against ISIS/ISIL/Da’esh at the request of Iraq’s government, 1 and is therefore in accordance with Article 51 of the Charter of the United Nations which recognises Member states’ ‘inherent right of individual or collective self-defence.’ Any military action in Syria as a humanitarian intervention would have to rely on a quite different legal justification. Chapter VII of the Charter sets out the functions of the UN Security Council (UNSC) in order to ‘determine the existence of any threat to the peace, breach of the peace, or act of aggression and shall make recommendations, or decide what measures shall be taken,’ including measures involving armed force, while recognising member states’ right of individual or collective self-defence. During the Syria crisis, the Security Council has been unable to fully carry out its functions under Chapter VII due to divisions amongst its five permanent members. The Security Council has determined breaches to the peace within Syria in several resolutions, but has failed to decide on measures after the parties to the conflict, in particular the Assad regime—the de facto Syrian state, failed to meet the demands of successive resolutions. The question is whether individual states can now lawfully use armed force against the Syrian state which, while it has breached multiple UK Security Council resolutions, has not made an armed attack against another state but only against its own population. There are three views under which proponents for a military humanitarian intervention argue that it may be legal without explicit UN authorisation. One is that there has been a loss of force of Article 2(4) of the UN Charter through repeat violations by numerous states. This argument is unattractive for reasons of its implications in other cases. A second is that an individual state has lost sovereignty through engaging in the worst kinds of human rights abuses of its citizens. In the case of Syria, the Assad regime has invited foreign terrorist forces, foreign militias, and a foreign air force, to aid it in attacking its own civilian population, displacing over half of that population and driving over a quarter of them out of their home country. A third view is that Article 2(4) is limited in scope and allows humanitarian action where such action does not compromise the territorial integrity or political independence of the state in question and is consistent with the purposes of the UN. In this third view, as acts by the Syrian state which violate multiple UN resolutions and violate International Humanitarian Law (IHL) cannot be regarded as legitimate political acts, an intervention which aims solely to halt these violations but not to impose a change in government nor to alter the territory of the state may therefore be legal. 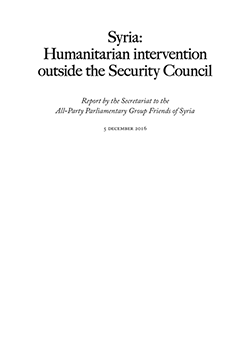 In the case of Syria, ‘purposes laid down by the UN Security Council’ can be found in a series of resolutions including Resolution 2139 which demands an end to shelling and aerial bombardment in populated areas, and demands that in particular the Syrian authorities promptly allow rapid, safe and unhindered humanitarian access for UN humanitarian agencies and their implementing partners, including across conflict lines and across borders. In October 1998 a Government note was circulated to NATO allies identifying these three key criteria. (iii) In using force against the Federal Republic of Yugoslavia in relation to Kosovo in 1999. This established UK Government view is then that a military humanitarian intervention in Syria without a further UN resolution would be legal provided the three conditions are met: that there is convincing evidence of extreme humanitarian distress; that there is no practicable alternative to the use of force if lives are to be saved; and that the use of force is strictly limited to that necessary to achieve the aim of humanitarian relief. Could a humanitarian intervention pass these three tests? On condition (i): The UN Security Council has since the passing of UN Security Council Resolution 2139 on 22 February 2014 been presented with monthly reports by the UN Secretariat on the scale of of extreme humanitarian distress and on violations of successive UN Security Council resolutions. On condition (ii): Despite monthly reports since February 2014 from the UN Secretariat on grievous violations of UN Security Council resolutions resulting in large scale loss of life, these violations continue and the UN Security Council continues to fail to take action to end these violations. On condition (iii): Meeting this condition requires clearly defined aims and clearly defined limits on ways to achieve those aims. Condition (iii) doesn’t require setting a timetable in advance for completion of action, but does require that once the aims have been achieved then action must cease. What action might a humanitarian intervention include? The three previous operations where the UK has engaged in a military humanitarian intervention outside of the UN Security Council have all used air power, whether to patrol a no-fly zone or to strike military or dual use targets on the ground; including targets that directly threaten civilians, or that enable military operations that threaten civilians, or that threaten UK or allied forces engaged in the intervention. Of those three operations, the Kosovo intervention had the widest range of types of targets hit and the highest toll of civilians killed by intervening forces. Cluster bombs were used extensively by NATO forces in Kosovo, 5 but cannot now legally be used in any intervention as the UK is a party to the Convention on Cluster Munitions. Enforcement of a no-bomb zone. Of these, the first might not necessarily require the use of force but would likely require the threat of force in order to protect UK air crews and aircraft. The UK would need to hold the de facto Syrian government in particular responsible for the safety of UK aid flights and to make clear that there would be a military response to any attack. The UK would need also to consider deploying combat aircraft along with transport aircraft in a force protection role. 6 Nonetheless this would represent a much more limited intervention than either the Iraq no-fly zones or the Kosovo intervention. A no-bomb zone was proposed by Jo Cox MP as a ‘prudent and limited use of force’ to deter the Syrian government from its unlawful indiscriminate aerial bombardments. 9 A no-bomb zone would be a prohibition on bombing in a defined area, whether all or part of Syria, enforced through deterrence and retaliation using stand-off weapons launched outside Syrian territory against Assad regime military targets on the ground. A no-bomb zone would not require targeting aircraft in flight. A no-bomb zone might not amount to a de facto occupation of Syria’s sovereign airspace because unlike a no-fly zone, a no-bomb zone would not require overflights by UK aircraft, nor would it restrict the freedom of aircraft to fly in Syrian airspace, nor would it require pre-emptive strikes on anti-aircraft defences. Defence of a safe zone. Precision attacks to diminish the Assad regime’s capacity to attack civilian targets were the response proposed by the UK Government to the August 2013 chemical weapons attacks on Damascus suburbs. Precision attacks on Assad regime airbases were previously proposed as a means of diminishing the Assad regime’s capacity to carry out air attacks on civilians. Attacks on ground forces, artillery, and armour, that directly threaten civilians formed the major part of NATO’s 2011 intervention in Libya as the Libyan regime’s air force was disabled in short order. Attacking a wider range of ground targets to protect civilians also brings greater risk of directly causing civilian targets, as well as risk of striking Russian forces fighting alongside the Assad regime. Defence of a safe zone carries distinct costs and risks. By defining a safe zone, an intervening power would risk encouraging population movement into the zone and increasing the humanitarian cost of any failure to defend the zone. Defence of a safe zone would depend on ground forces as well as air power, whether they be UK ground forces or more likely local allies’ ground forces. While a safe zone is perhaps the least attractive option for the UK, it is notable that Turkey’s Euphrates Shield intervention in alliance with Free Syrian Army forces is creating a de facto safe zone in a limited area of northern Syria. The justification for the Euphrates Shield operation is not humanitarian but self defence by Turkey against ISIS and the PKK. This points to a potential future issue where, if the UK cooperates with local allies to take territory from ISIS, the UK may then be seen as responsible for the continued safety of the populations of those areas and come under pressure to protect them from any attack by the Assad regime. For any humanitarian intervention option, the question of whether force is necessary or proportionate in compliance with condition (iii) is a question of fact and law which requires scrutiny in the context of the particular circumstances at the relevant time. The laws of armed conflict apply. If the UK were to mount any military intervention, the rules of attack would apply in precisely the same way with UN Security Council authorisation or without it by way of a humanitarian intervention. The relevant laws of armed conflict include the principle of distinction, such that military operations are only directed against military objectives; proportionality; and the requirement to take precautions in attack. The application of the Additional Protocol 1 (AP1) principles must be applied to the type of ‘prudent and limited’ military action envisaged. (v) Different rules apply in relation to attacks on aircraft. It is important to establish the status of those on board. The law of armed conflict requires that if doubt exists regarding a person status they shall be considered to be a civilian. Precautions must be taken in relation aircraft because of the risk that civilians may be on board. Precaution must be taken as to the operations, means and methods, and rules of engagement. AP1 Art 57(1) requires ‘constant care… to be taken to spare the civilian population, civilians, and civilian objects.’ This is subject to several further constraints in terms of taking every feasible step to very the objectives to be attacked and establishing the nature of any aircraft before engaging it etc. This approach seeks to answer the question of whether military attacks would be necessary and proportionate to achieve humanitarian considerations to protect civilians. The question of what types of attacks are envisaged is critical and where the balance lies (necessity/proportionality) would depend on the individual facts and circumstances. While it is the established position of the UK Government that a military humanitarian intervention may be legal without explicit UN Security Council authorisation subject to the three tests set out earlier, it is clearly preferable for the legitimacy of any action to be recognised by international bodies and in particular be recognised by the UN. Resolves that if the Security Council, because of lack of unanimity of the permanent members, fails to exercise its primary responsibility for the maintenance of international peace and security in any case where there appears to be a threat to the peace, breach of the peace, or act of aggression, the General Assembly shall consider the matter immediately with a view to making appropriate recommendations to Members for collective measures, including in the case of a breach of the peace or act of aggression the use of armed force when necessary, to maintain or restore international peace and security. The ‘Uniting for Peace’ resolution sets out a path for the General Assembly to offer ‘recommendations’ only and not binding measures, unlike a Security Council resolution under Chapter VII of the UN Charter. It therefore seems the General Assembly can add little in terms of legal force to the existing Security Council resolutions on Syria. The civil society statement stops short of an outright call for the General Assembly to back military humanitarian intervention. Recognition of the political potential of a General Assembly resolution should be balanced against the time needed to achieve it, and its limited legal force compared to the UK Government’s position that there already exists a legal basis for military humanitarian action outside the UN Security Council. A humanitarian intervention by the UK, whether aid drops, no-bomb zone, or other measure, would be legal provided it was in support of purposes laid down by the UN Security Council in Resolution 2139 and subsequent resolutions and that it complied with the UK Government’s three tests for humanitarian intervention. 1. Legal basis for UK military action in Syria, House of Commons Library, 1 December 2015. 2. Resolution adopted by the General Assembly, 60/1, 2005 World Summit Outcome, 24 October 2005. 3. House of Commons debate on Kosovo, 25 Mar 1999. 4. Further supplementary written evidence from the Rt Hon Hugh Robertson MP, Minister of State, Foreign and Commonwealth Office: humanitarian intervention and the responsibility to protect, 14 January 2014. 5. Explosive remnants of war: Cluster bombs and landmines in Kosovo, International Committee of the Red Cross, August 2000, revised June 2001. House of Commons debate on Aleppo, 28 November 2016.
by Okab Malek, Zaman Al Wasl, 11 September 2016. 8. Remarks by Hamish de Bretton-Gordon, APPG Friends of Syria meeting, 13 September 2016. Civilians in Syria, House of Commons adjournment debate, 12 October 2015. 10. Legal advice on civilian protection in Syria, from Kirsty Brimelow QC to Independent Diplomat, 16 November 2015. 11. Uniting for Peace in Syria: Global Civil Society Appeal to UN Member States, 1 December 2016.